This catalogue covers the larger and heavier duty pumps. It refers users to their other catalogue for the lighter pumps: "hand pumps, pitcher pumps, lift and force pumps, yard pumps, farm pumps, deep well pumps, contractors' pumps, chain pumps, rotary pumps, horse pumps, fire pumps, ships' pumps, gaswork syphon pumps, colliery syphon pumps, small treble ram pumps, small power pumps, wind mill pumps, centrifugal pumps, hydraulic rams, etc..". 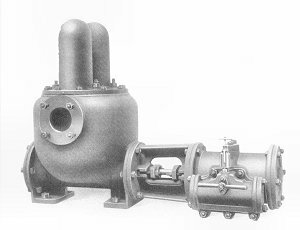 That list, taken with the types of pumps shown here, indicate the enormous range of specialist pumps that the company made. Many of them must have been made to order and stocking spares must have been quite a problem. It is perhaps surprising that it seems that it was not until the 1950s that they made a determined effort to rationalise and generalise their range. More than half of the catalogue is occupied by Cornish steam pumps. This one is the Cornish Direct-Acting Steam Pump (Bucket Type) Globe Pattern. As in most cases of Cornish pumps there is a reference to Evans' and Tonkin's Patents. 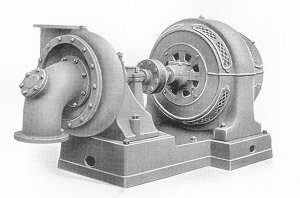 It is not known that Evans ever introduced any radical departure in pumps and their patents were probably for changes to the basic machine. 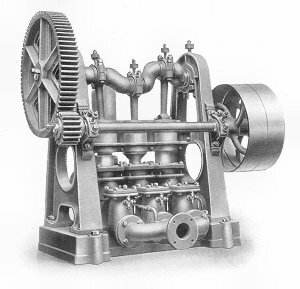 This is the Cornish Compound Steam Pump, described as being "compounded for the more economical use of steam". 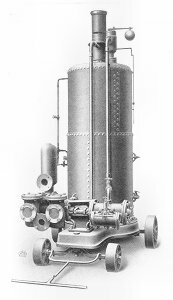 This is another Cornish Direct-Acting Steam Pump but it has Evans' Improved Suction Condenser. Like all of their pumps, this one comes in various conformations. In one conformation it is said that it will pump 39,980 gallons per hour. 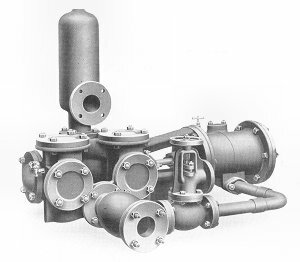 Some pumps are horizontal only, some are vertical only, and some can be mounted either way. On the left is a Vertical Cornish Direct-Acting Sinking Pump. 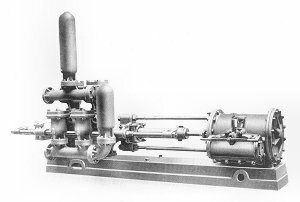 Note the ring and chain at the top by which the pump could be lowered down a shaft to "within suction distance of the water". 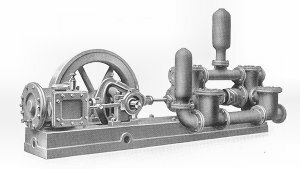 On the right is a Cornish Direct-Acting Steam Pump with vertical cross-tube boiler "mounted on wheels for portability". 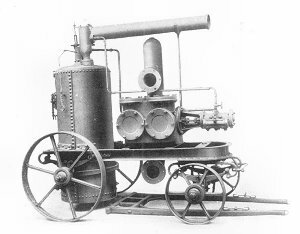 The Portable Cornish Steam Pump and Boiler (Bucket Type) "designed specially for low lifts, such as emptying mains and trenches and for irrigation purposes". This is 1930 but Richard Trevithick would have felt quite at home with this machine. 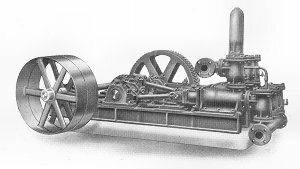 The Cornish Double-Acting Steam Pumping Engine (Outside-Packed Ram Type) "specially adapted for high lifts in collieries and mines" and for gritty water. The catalogue eventually moved away from Cornish pumps. 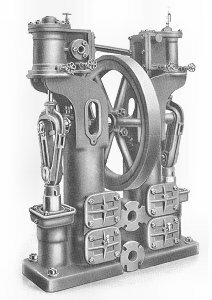 This is the "Reliable" Pumping Engine (Outside-Packed Ram Type) and is "specially adapted for high lifts in mines etc.". The height of the lift depended on various factors, not least the steam pressure available. But the highest figure claimed for this pump is a lift of 940 feet! We are now getting into the big stuff. This is a Double Ram Compound Steam Pump with Compound Cylinders and Two Rams. In one of its conformations it is said to deliver 39,980 gallons of water per hour. The Premier Air Compressor or Acid Pump. This can be used for exhausting or compressing and it should be remembered that there were and are many industrial applications of compressed air. 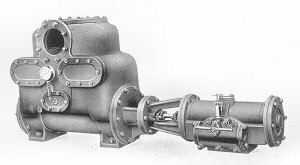 The Cornish Vacuum Pump. (Note the vacuum gauge). This is "for use with Surface Condensers, Vacuum Pans, Cyanide Plants, etc.". It is only quite late on in the catalogue that we get to a relatively few pumps which recognise that electricity has arrived. This Vertical Treble Ram Pump is "fitted with machine cut gearing, countershaft and fast and loose pulleys for driving from shafting, gas or oil engine or electric motor". Likewise, this Horizontal Treble Ram pump can be driven in the same ways. And the very last pump in the catalogue is the only one with an electric motor fitted. 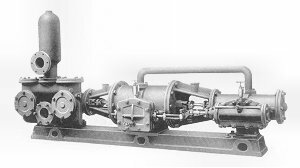 It is the Evans' Centrifugal Pump with Electric Motor. The catalogue winds up with a selection of fittings such as wheel valves, retaining valves, foot valves, strainers, junction valves, cup leathers, hat leathers and U leathers and a variety of hoses.